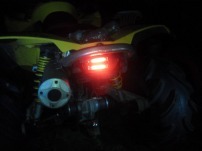 We have had many customers looking to change out the stock taillight on CanAm vehicles (Outlander & Renegade)�to a brighter and more durable LED unit. 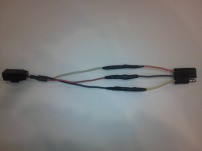 In doing so, you need to first select a LED taillight to replace the stock unit, and then, because of the negative polarity on the vehicle, you need to purchase an adaptor to change the polarity and make the LED function (LEDs will not light with reverse polarity). At Brite Lites, we offer both items needed and can get you up and running. 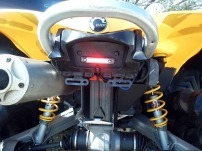 These photos are a few examples of our 4" clear lens LED taillight strip mounted on the tail of a newer model CanAm ATV. Notes to consider: 2 of the 4" light strips are recommended to fill the space, and put the second above the one pictured, and use the stock mounting holes. Also, the piece of plastic the light is mounted to was cut to shape and added, and the adaptor is mounted inside to make for a clean and finished look. Also, If ordering these items for your CanAm Outlander or Renegade, please add a comment in the checkout of our shopping cart that the pigtail is needed, or that it is for a CanAm (the Adaptors are built for Polaris vehicles and the pigtail is not typically included). We'll gladly add it to the order for no charge! 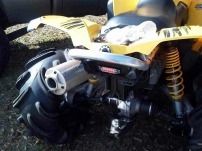 Thanks Sean for sending the pics in - nice bike! !